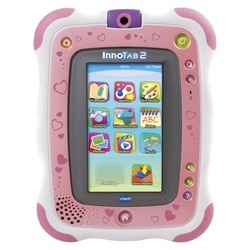 _For 2012, VTech have revamped and upgraded their popular InnoTab tablet with more features, more games, and more fun for kids aged 3 to 9. With a 5" touch screen and tilt sensor, kids can play games, watch videos, read ebooks, record with the built-in microphone, or just chill out listening to their favourite tracks. on the MP3 player. Like most kids tablets this year, the InnoTab 2 comes with pre-loaded apps and games., including an ebook and the art studio app, where they can release their inner Hockney and create masterpieces on screen. They can plan their social diary on the calendar, or create a friends list. Kids can also use the notes app to note down what additional apps they'd like to download from the Learning Lodge Navigator website from the 200+ available. All downloads are delivered via a secure Wi-fi, so you don't need to plug in the InnoTab into a PC to get apps. _The 2Gb internal memory can be expanded by popping a SD cards into the slot, to boost capacity to up to 32GB, ready to store pictures and video taken with the InnoTab 2 rotating camera. 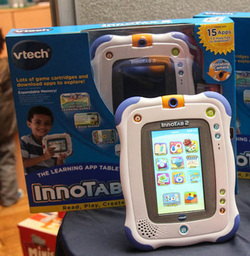 Up to four kids can have profiles created on one InnoTab, so that should keep squabbles to a minimum. 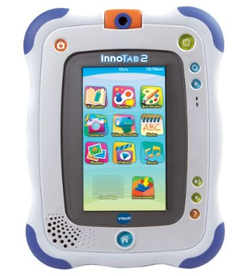 With its emphasis on learning and educational games, Innotab 2 will appeal to parents, especially as additional activities can be purchased on InnoTab software cartridges that bundle an e-book with three learning games and two creative activities. Unlike other tablets, there is no direct access to the Internet via wi-fi, but for many parents, this will be a relief, as you don't need to navigate complex filters or controls to keep your kids off the net.